So… It’s been a while since our last review. We have had a lot going on so here are some quick reviews on a few of the movies we’ve seen recently. This one I saw by myself (online for free, but don’t tell anyone). Now I’m not going to get into all the political aspects of how much of this was “truth” and what was Hollywood. Most likely, what ever your views on the war in Iraq are, they are going to be that regardless of this movie. That being said, this pretty much was Jason Borne takes Iraq. I didn’t realize before I saw it that it was based on true events or that it was even an Iraq war movie. But it didn’t matter. Packed with action along side the intriguing plot, it was very entertaining and thought provoking. It got a lot of knocks saying that there wasn’t enough action, but I found it to be quite fulfilling. Though it was more warfare rather than hand to hand combat, as the Borne movies were. Kevin: 8.25 of 10 stars. I don’t want to waste too much time here. Not much chemistry for a romantic comedy. Not many laughs for a romantic comedy. Not much of a storyline for a romantic comedy. Not much entertainment for a movie… period. Gina: Biggest waste of money since All About Steve. 2 of 10 stars. Kevin: 2.5 of 10 stars. This was a refreshing movie going experience since there was a bit of a lull before it. John Cusack re-emerges into this comedy of a hot tub that takes four friends back to an 80’s party they attended earlier in their life. Why? Who knows, but it was hilarious. The jokes flowed throughout the film, save for one little lull where they had to add a bit of a love story aspect – it is a Cusack movie after all. The performances were great and suited the feel of the nostalgic 1980’s. George McFly as the one armed bellhop was great to see pop up every five minutes; once with chainsaws, once on the roof, once in front of a truck, all with perfect timing. Chevy Chase is also fun to see making a comeback. It’s so easy to relate to this movie since everyone dreams of going back in time and what you could do - fix a relationship, invent the iPod, etc. And if you were going back in time, what better place to go than the 80’s… Of course! Chad: If it weren’t for She’s Out Of My League, this would have been the funniest movie of the year so far. 4 of 5 beers. Gina: 8 of 10 stars. Kevin: 8 of 10 stars. We were all so excited to see this in the theatres, not just to see what they can do to update the awesomely created stop-motion special effects of the 1981 classic (I mean, those effects were so beyond their time they could still give Avatar a run for it’s money! 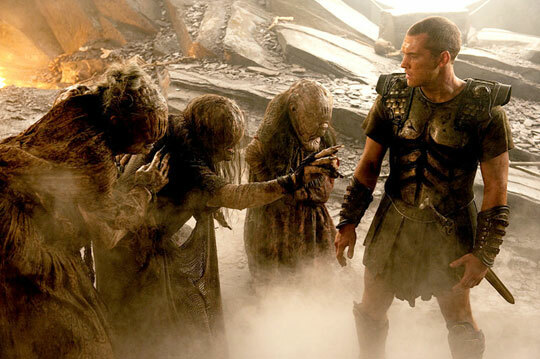 ), but also to see if Sam Worthington is going to be branded into this fantasy action type cast. Kevin: With three action movies in a row, isn’t about time to play roulette with his career by signing on for a romantic comedy? But to the movie, if this is what 3D movies now are going to settle with, then I don’t think I will pay to see them anymore. There was no 3D in the movie, so don’t waste the extra money. It was very disappointing to have it be that bad; it was just distracting because you were constantly searching for the effects. The movie itself was decent. The fight scenes where nicely shot and edited together. The scorpion scene would have played better later in the film; having it so soon kind of overshadowed the highly anticipated (and over hyped) Kracken. This also attributed to the underwhelming conclusion. Chad: 4 of 5 beers for the movie, 1/2 of 5 beers for the 3D – no, you don’t add that together. Kevin: 6.9 of 10 stars.